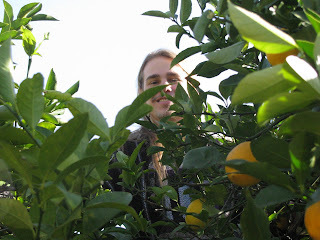 We have a navel orange tree and a lemon tree in our backyard. The lemons are "Portugese Lemons", or so we've been told. They are thick-skinned and quite sweet, as lemons go. They look a bit like Meyer lemons but they taste different. Every year, I pick bags and bags of lemons to give to friends. Many drop off the tree and rot. Some stay there on the branches (just out of reach) for a year or more, getting big as grapefruit. When a recipe calls for lemon, I gleefully pick one or two .. but trying to use them up is a futile exercise. They just grow like crazy. The orange tree is further back in the yard and I have ignored it for nearly a decade. The oranges are large and juicy but not very sweet. This year, the peach tree that used to hog the sunlight from the orange tree has diminished a bit, and the orange tree is booming. New fruit, hard and green, is ripening fast. The older oranges pull the branches down with their golden weight. I don't want to pick all the fruit off the trees, because I want to be able to pick a lemon or orange whenever I need one, but I want the fruit to be sweet and I don't want to overburden the tree with excess baggage. We have been picking, and picking, and picking. We pile them into the wheelbarrow and put them in front of the house, with a sign that says, "Free Lemons and Oranges - Help Yourself!". People stop their cars and send their kids out to gather a bunch. Many neighbors have been thanking us, including the postal carrier, who loves the lemons.